In the early 1950s, when I was a young girl, milk was delivered to the wooden box on the porch of our house three times a week. My mother put empty bottles in the box and took out full bottles of fresh milk. It was a miracle to me. I never saw who brought them and yet they came like clockwork. I shouldn’t have been surprised. You see, my dad was a milk peddler. My dad’s father was a wandering man; a minor-league baseball player and a performer in minstrel shows. In 1930, during the Great Depression, my grandfather, knowing he couldn’t take care of his four children, got in his car one day and drove away. My dad was twelve years old. He never saw his father again. There were no safety nets then; no welfare, food stamps, Medicaid. My grandmother had no choice but to get a job. The income from her job wasn’t enough. My dad and his two brothers had to go to work, too. Only their younger sister was exempt. My dad chose peddling milk, a job he had from the time he was 12 years old until he was 17, from 1930-1935. Starting at 5:30 in the morning and finishing by 8:30, he always made it to school just in time. My dad hung on the side of the truck as it wound its way through the hills of Little Falls, NY. The truck slowed and my dad jumped off and on, carrying bottles of milk to the front porches of houses or outside people’s doors in rooming houses and apartments, picking up empty bottles. Over those five years, my dad made about $1,000. In addition to the money, my dad’s family got all the milk they wanted for free. When times were tough for the family, meals were often simply saltine crackers covered with milk. For his entire life, that was my dad’s favorite midnight snack. It came from those years when money was limited but milk was plentiful. Much to my grandmother’s dismay, my dad learned how to cuss while peddling milk because he got cussed at a lot. 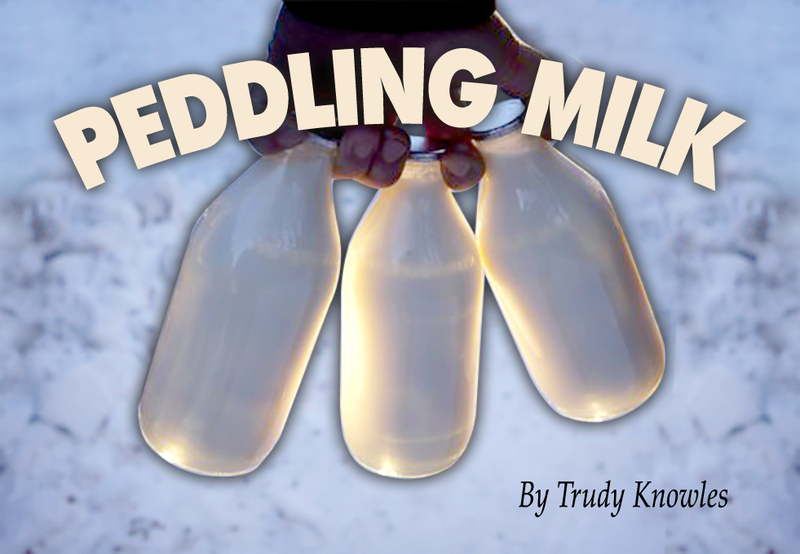 The world was asleep when the milk peddlers did their rounds, at least until my dad dropped a bottle of milk and it rolled down three flights of stairs in an apartment building. Once he stepped on a cat’s tail in the dark. Even the sound of the milk truck going down the street early in the morning was enough to have a half-asleep man yell out the window, “Keep it quiet out there,” with some nice cuss words after. My dad remembered one particular day when it was ten below zero and yet “the milk must go through.” The slight thaw of the day before had frozen under the new fallen snow, leaving sidewalks unshoveled and treacherous. That day, every neighbor was able to quickly open their door, grab the milk bottle and retreat to the safety of their house because my dad, with his frozen ears and fingers, got the milk there on time. My dad loved his job. Cold, wet, damp, or frozen, he was happy. Why? Sure, he got free milk. Sure, he got a paycheck. That’s not why he loved his job. What he loved most was that he was up in the morning before the sun came up. He breathed fresh air that hadn’t been breathed before. He saw hundreds of sunrises. He never tired of it. My dad peddled milk because his family relied on it. He loved peddling milk for much more than that.